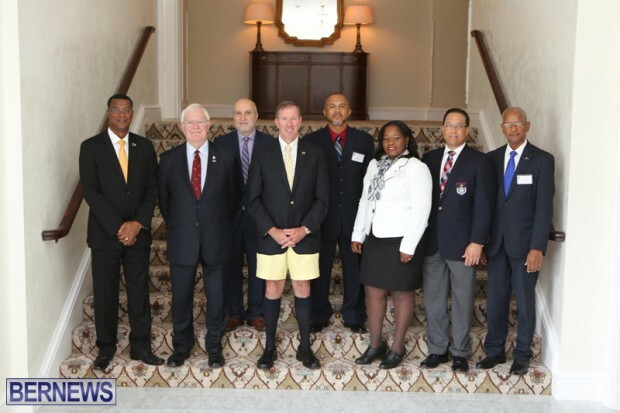 The UK Overseas Territories heads of Government are in Bermuda this week for the Pre-Joint Ministerial Council meeting, which serves as precursor for the Overseas Territories Joint Ministerial Council meeting to be hosted by the UK Government in London later this year. Leaders attending the meeting include Premier of the British Virgin Islands Dr. Orlando Smith, Premier of Cayman Islands Alden McLaughlin, Premier of Turks & Caicos Dr. Rufus Ewing, Deputy Premier of Montserrat Dolmades Ryan, Member of the Legislative Assembly of the Falkland Islands Roger Anthony Edwards; while Ascension Island, Tristan Da Cunha, St Helena and Pitcairn are being represented remotely. In his opening remarks today [July 23], Premier Dunkley said, “In the year since we last met, each of our Territories has faced continued economic headwinds which continue to slow the pace of our recovery. These challenges have tested our democracies and our ability to navigate our people safely through the choppy waters of recession. “Our meetings this week are held against a backdrop of cautious growth in the US, pockets of turmoil in the EU and complex tourism dynamics in the Region. Added to that are the social issues that occupy our domestic agendas, including the threat of the gang lifestyle, increasing healthcare costs and the ability of governments to provide relief for the most vulnerable of its citizens. “There is cause for much hope within the Territories. Each of us in our own ways continue to ‘punch well above our weight’ on the international stage. “This is something of which we are justifiably proud and which we must continue to do. Irrespective of our diverse economic interests we have to keep in mind there is strength in unity. “That unity is increasingly important in our relationship with the UK Government. Recently strengthened by a clear majority in Parliament, Prime Minister Cameron is at liberty to examine policies afresh and so it is vitally important for us to be in harmony on issues that affect us as Territories. This is particularly so on the issue of beneficial ownership. 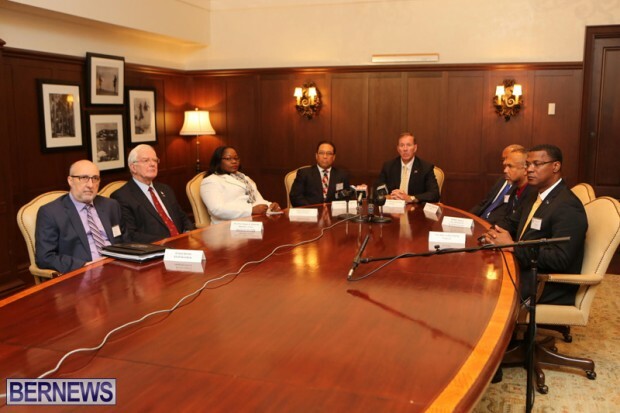 “Bermuda has and will continue to make a strong case for our compliance with international best practice and ensure sound regulation as an offshore business jurisdiction. Our regime is robust and I am confident that repeated often enough, those outside this region will come to accept our position on this issue. “One of the lessons we have learned in terms of managing outside pressures on these matters is to correct misinformation head on and immediately. The importance of engaging directly with those who form opinions and make regulations cannot be overestimated. “It is critical that our Ministers of Finance and technical officers are well versed in these issues and that they are prepared to clearly and forcefully articulate our case in any forum. “I spoke of unity a short time ago and it is a theme which I believe bears repeating. We must continue to strengthen our sharing of knowledge and information,” continued the Premier. “Where we have had success, we should be open to sharing with each other what we have learned. In law enforcement, healthcare, social studies and domestic policy making; we carry with us a wealth of information that can help others, and it is all just an email or phone call away. “As we prepare for this year’s Joint Ministerial Council, let us approach the UK Government in strength. Good morning colleagues and friends and of course welcome to Bermuda. Before I start in earnest, I’d like to acknowledge the recent elections in Montserrat and look forward to working with the Premier, the Hon Donaldson Romeo and welcome his Deputy Premier the Hon. Delmaude Ryan, who is here with us today; the Chief Minister of Anguilla the Hon Victor E Banks who is represented by the Hon Evans McNeil Rogers, Minister of Social Development and congratulate the returning Premier of the British Virgin Islands the Dr. the Hon Orlando Smith, OBE. My friends, the gracious hospitality afforded us last year by Premier McLaughlin and the people of the Cayman Islands is a hard act to follow, but my hope is that you find Bermuda welcoming, beautiful and so irresistible that our tourism can count on your return. In the year since we last met, each of our Territories has faced continued economic headwinds which continue to slow the pace of our recovery. These challenges have tested our democracies and our ability to navigate our people safely through the choppy waters of recession. Our meetings this week are held against a backdrop of cautious growth in the US, pockets of turmoil in the EU and complex tourism dynamics in the Region. Added to that are the social issues that occupy our domestic agendas, including the threat of the gang lifestyle, increasing healthcare costs and the ability of governments to provide relief for the most vulnerable of its citizens. There is cause for much hope within the Territories. Each of us in our own ways continue to “punch well above our weight” on the international stage. This is something of which we are justifiably proud and which we must continue to do. Irrespective of our diverse economic interests we have to keep in mind there is strength in unity. That unity is increasingly important in our relationship with the UK Government. Recently strengthened by a clear majority in Parliament, Prime Minister Cameron is at liberty to examine policies afresh and so it is vitally important for us to be in harmony on issues that affect us as Territories. This is particularly so on the issue of beneficial ownership. Bermuda has and will continue to make a strong case for our compliance with international best practice and ensure sound regulation as an offshore business jurisdiction. Our regime is robust and I am confident that repeated often enough, those outside this region will come to accept our position on this issue. One of the lessons we have learned in terms of managing outside pressures on these matters is to correct misinformation head on and immediately. The importance of engaging directly with those who form opinions and make regulations cannot be overestimated. It is critical that our Ministers of Finance and technical officers are well versed in these issues and that they are prepared to clearly and forcefully articulate our case in any forum. These matters of international scope are but one facet of our work as leaders of Overseas Territories. At home, we are faced with a domestic agenda that demands equal attention. The expectations of our people have been disappointed by the challenges of unemployment and inadequate revenue. The task, as you all know, is difficult. We cannot simply balance budgets through redundancies or cost cutting without regard to impact. The people affected by either of those actions have nowhere else to go; not the next state, county or district. So we have to find creative ways to reduce spending and balance budgets while restoring growth to our economies. These economic and fiscal challenges also have social consequences. It is hard to build national morale in a period of no or slow economic growth. But our task as leaders is to remain committed to policies that we believe will achieve growth while inspiring our people to play their part and doing all we can to support citizens who truly need assistance. I spoke of unity a short time ago and it is a theme which I believe bears repeating. We must continue to strengthen our sharing of knowledge and information. Where we have had success, we should be open to sharing with each other what we have learned. In law enforcement, healthcare, social studies and domestic policy making; we carry with us a wealth of information that can help others, and it is all just an email or phone call away. As we prepare for this year’s Joint Ministerial Council, let us approach the UK Government in strength. Let us present a united front in those areas that matter to all of us. Let us work together to represent the best interests of the people we were elected to serve and to guard against pressures that would otherwise threaten those interests. My friends consider Bermuda your home for this short time and let the beauty of the Island and the warmth of our people foster a spirit of unity of purpose in our deliberations. On behalf of many I take this opportunity thanking you Premier Michael Dunkley for, “placing one foot in front of the other.” Job well done! On behalf of the many I’d like to thank those in his party who daily try to untie his shoelaces . I’ll give you a point for that one Coffee. Last of the babies holding on to the apron. You, on the other hand, remain lame. No point for you. Approaching the British nanny in strength will get the reply’ If you don’t behave; I will sent you to bed without any suffer. Legalise medical marijuana and take control of taxes associated with it and regulate it’s content…too many additive with associative issues at present.It is choice…and freedom offit.You do you…and we will do us!